Another Kill Team ready for action - A band of Heretic Astartes and Chaos Cultists. 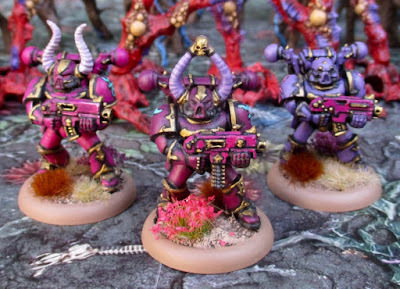 The team are worshippers of Slaanesh - These warriors exist to experience - and inflict - the most extreme physical and mental stimuli through the medium of spectacular violence. They are searching for an Arcane Prize - Despatched by their powerful master, this kill team must acquire and eldritch artefact for their master or die trying! They are also utterly insane - Whether guided by ineffable prophecy, or finally pushed past the final boundary of rational though, the deeds of tehi skill team seem like madness to their foes. Xanthaleng, Aspiring Champion - Leader Specialist - Bolter, Bolt Pistol, Frag and Krack Grenades - 13 points. Xanthaleng is a True Believer; his faith in Slaanesh is unquestioning, his devotion absolute. Arngbaal, Chaos Space Marines - Veteran Specialist - Bolter, Bolt Pistol, Frag and Krack Grenades -12 Points. Arngbaal has been fighting for many lifetimes of mortals and has honed her skills to absolute perfection. Zothirag, Chaos Space Marines - Demolitions Specialist - Bolter, Bolt Pistol, Frag and Krack Grenades -12 points. Zoithirag is deranged; giggling and singing dark daemonic rhymes, he appears utterly insane. Chazmaz, Chaos Cultist Gunner - Heavy Specialist - Heavy Stubber - 5 points. Chazmaz is an unstoppable force; Brutish and monstrous, he blasts through everything in his path. The rest are all regular Chaos Cultists with Autoguns. Game Reports? Seriously. It's a long weekend. We have nothing planned. I really need to get some games in as ToonCon is just a WEEK away!!! After that...? I am still working on and Adeptus Mechanicus Kill Team. I hope I can finish it up early next week and get to play it a few times before next weekend. Lots of good looking chaff and some splendid chaos marines! Really looking forward to your Adeptus Mechanicus kill team! 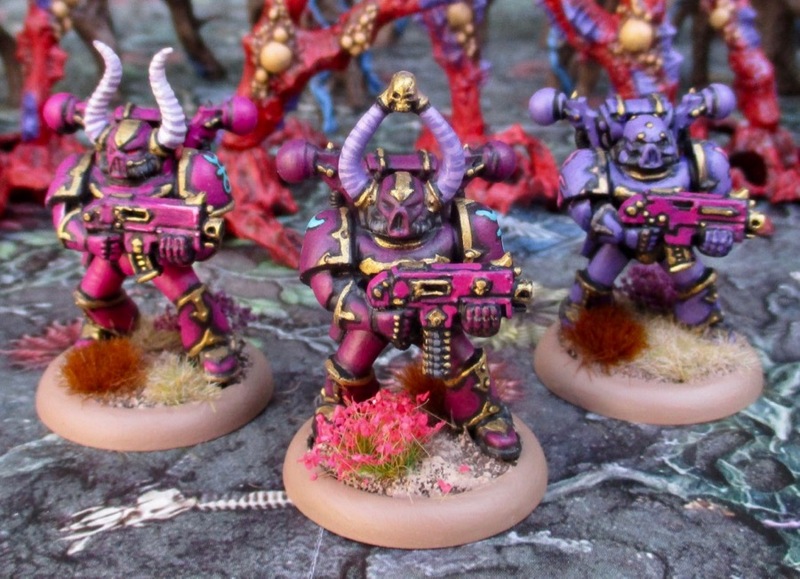 Very nice- I’m looking at an incredibly similar Slaanesh Kill Team myself!